After the fire comes the ice in Guild Wars 2: Heart of Thorns. The third episode of Living World Season 3, “A Crack in the Ice,” is now available. Players can log in today to continue the story of what’s happening in Tyria since the death of Mordremoth in Heart of Thorns – a flood of unbound magic, the rise of two Elder Dragons to threaten the land, and the birth of the new dragon scion, Aurene. 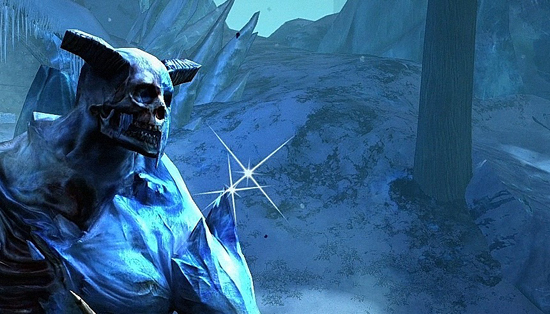 In "A Crack in the Ice," players will explore Bitterfrost Frontier, a new map in the Northern Shiverpeaks which is home to some of the Elder Dragon Jormag’s most powerful minions. Over the course of Season 3, players have been unlocking new ways to move through the new maps and counter enemy attacks with the Ancient Magicks mastery; Episode 3 introduces a new mastery tier that will aid them as they venture into the bitter cold. Along with “A Crack in the Ice” comes the brand-new Nightmare Fractal, in which players will venture into the Mists to face a challenging echo of the toxic Tower of Nightmares. In this five-player instanced dungeon, players will fight through all-new bosses and encounters, including dizzying new mechanics inspired by the “bullet hell” genre of shooting games to keep even the most experienced adventurers on their toes.